Georgiana, Duchess of Devonshire, was the subject of many satirical prints that ridiculed not only her fashion sense but also her involvement in politics. In a time when women were supposed to stay at home taking care of their husbands and children, a woman who overstepped these boundaries was seen as threatening and out of control and was thought to be of loose morals. And Georgiana did overstep the boundaries when, in 1784, the year her first child was finally born after years of miscarriages, she became the first woman to canvass for a political leader. The candidate she supported at the Westminster elections was Charles James Fox. Satirists and cartoonists had a field day with it. 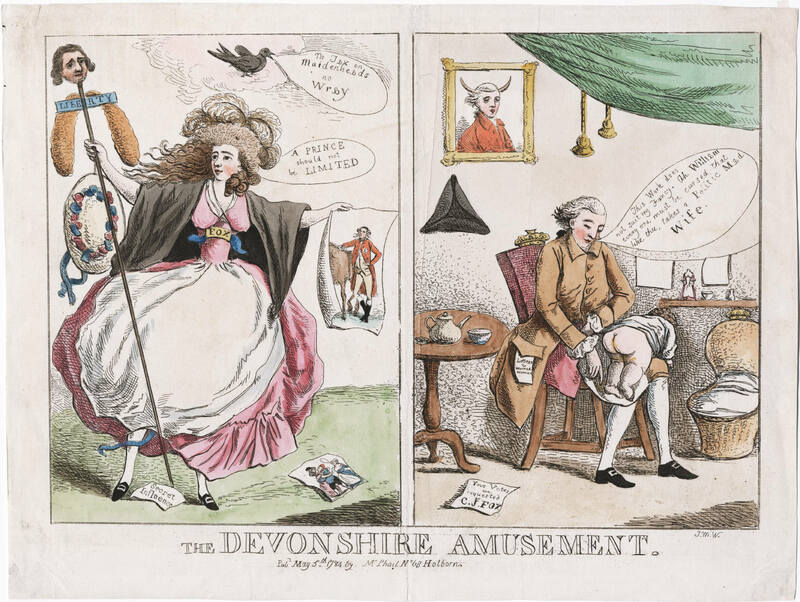 One of the most famous prints published in that year was The Devonshire Amusement, which could succinctly be described with the words of a contemporary newspaper: “while her Grace is busied in canvassing the Constituents, her domestic husband is employed in the nursery”. The Duke too is ridiculed in this print for being a weak man not able to control his wife. Although I doubt he cared much about what the papers said about him… The Devonshire Amusement is divided in two parts. On the left, the “Political Mad” Duchess. She’s wearing ostrich feathers in her hair (she was often ridiculed for introducing this fashion) and a Fox favour on her bodice, while a loosen garter, with the motto “Cavendo tutus” on it, appears from under her petticoat. Cavendo tutus is the Cavendish family motto and means “safe through caution”. In one hand, Georgiana’s holding a staff which has on it the head of Fox (he can be easily identified by the two fox tails hanging from the staff) and a cross-piece with the word “liberty” written on it. In her other hand, she’s holding a print depicting The Prince of Wales (the future George IV), who was one of the leading figures of the Whig party and a friend of Georgiana. The Duchess is saying: “A Prince should not be limited”. At the feet, on the ground, there’s a peace of paper that bears the words “Secret Influence”, while above her head a bird is flying and saying: “No Tax on Maidenheads no Wray”. On the right is depicted Georgiana’s husband William. He’s sitting in a chair, which has a ducal coronet on the back, with his daughter on his lap. Next to him, clean towels are hanging on a line, which suggests the Duke is busy changing a nappy. But he’s not happy about it. He’s saying: “This Work does not suit my Fancy. Ah William every one must be cursed that like thee takes a Politic Mad Wife”. A paper titled “Letters to Married Women” is hanging from his coat-pocket, while on the ground there’s another sheet with the words “Your Votes are requested for C. J. Fox”. Behind him, on the wall is hanging a portrait of him with horns, which hints at the fact he’s a cuckold. The room is also furnished with a shelf with pottery on top of it, a table on which are a tea-pot and a cup, while at the Duke’s feet lies the baby’s cradle. What I really like about this print is that, although at the time it was clearly intended as an insult to the Devonshire couple, now it can be seen to represent women’s emancipation and their freedom to choose their own path in life. And it is also a perfect example of why I am fascinated with Georgiana. She wasn’t just a pretty face setting the latest fashions, she also had a personality to boot, was involved in politics and had an influential role in the Whig party at a time when women were usually confined to their domestic duties.